Dr. Handell joined the practice of Dr. Schoenbart in June 2004. Dr. Handell graduated from the State University of New York College of Optometry in 1988. She is a former clinical instructor in the Contact Lens Clinic of the College. She brings to the practice many years of experience from diversified optometric practices. 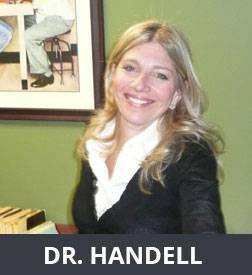 Dr. Handell has worked with renowned pioneers in the development of contact lenses where she has had extensive training in hard to fit cases. She has a great deal of experience in examining both pediatric and adolescent patients. Dr. Schoenbart and Dr. Handell are both licensed to treat eye diseases with therapeutic pharmaceuticals including ophthalmic antibiotics, antiviral, steroid drops, glaucoma and allergy eye medications. Both doctors are members of the American Optometric Association, New York State Optometric Association and the Nassau County Optometric.